As the term suggests, 'broadband only' deals are products that offer an internet connection but do not include additional services, such as TV or home phone, which are also often provided by broadband suppliers. A broadband only deal is perfect if you don’t need or want these add-ons. Because broadband only deals are very keenly priced, they’re a great way of saving money too. What are the advantages of broadband only deals? One of the main selling points of broadband only offers is that they’re very cheap. This makes them ideal if you’re looking to cut your outgoings. What’s more, because they don’t come bundled with a host of other services, it's much less likely that you'll end up paying for a service that you do not make use of. Unlike complicated bundles, broadband only deals are also supremely simple to understand. Which companies offer broadband only deals? Although a major trend among broadband providers is expanding the number of services they offer and bundling these together, there is still a vast range of broadband only options to choose from. 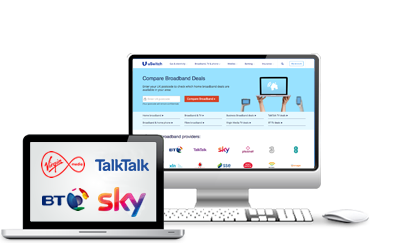 The broadband providers currently offering broadband only deals include Virgin Media, Plusnet and Sky. Here we’ll talk you through what each one offers to help you find the right broadband only deal for your needs. Plusnet consistently scores highly for the outstanding customer service it offers. Its broadband only deals are similarly highly rated. With Plusnet, you can get ADSL broadband with average speeds of 10Mbps or fibre broadband, with average speeds of either 36Mbps or 66Mbps, depending on which package you choose. Virgin Media is the only UK provider to offer a broadband only deal that provides the subscriber with a cutting-edge fibre optic broadband connection. Virgin Media's premium broadband-only product offers a connection speed of 362Mbps, making it by some distance the UK's fastest broadband supplier. Wireless routers are provided free by Virgin Media with all broadband only products.